My artistic style is very random. Sometimes I enjoy clean lines and symmetrical patterns, other times random bursts of color and texture seem to spill out. I love seed beads. The way you can make them shape and color in any form of your imagination is magical. 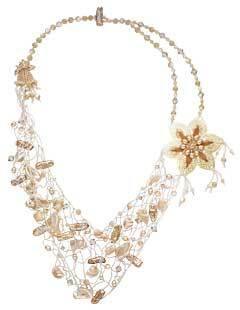 The process of working with seed beads is soothing and rewarding. I started with the flower focal component and somehow the rest just poured out. This is a true example of 'letting the beads speak to me'. This is one of the rare pieces I sketched out before I began and actually stayed pretty true to my sketch. I am often asked this question and can't really give a direct answer. I've always been a crafter, but can't seem to pinpoint the time at which I discovered my life overflowing with tiny containers of beads. My grandmother did wonderful bead embroidery. I remember being in awe of her work when I was a child and am still struck by the beauty of her work. I come from a pretty crafty family, but have no formal artistic education. Everything I know about beads I learned from reading, researching, and trial and error. I would love to take an art course and am constantly striving to expand my artistic abilities. You know the little catalogs you send with every order? I was participating in a craft show when the lady a few booths down asked if I wanted her extra catalogs. I was in complete amazement while thumbing through. So many things I hadn't seen before and so many resources! I wish I knew who that lady was so I could thank her for introducing me to Fire Mountain Gems. My hands can't seem to sit still. I love to crochet infront of the television or while listening to a book. I've also dabbled in and enjoy cross stitch, plastic canvas, latch hook, and several other crafts. I love to read, but that's hard to do while you're crafting. I am hoping to be able to join the Upper Midwest Bead Society in 2011. I think I could really learn a ton and would have so much fun being surrounded by people who are just as addicted to beads as I am. My husband will tell you that I would eat, sleep, and breathe beads if I could... he's probably right. I bead to support my habit and make a little extra cash. I'm working on making beading my full-time career. I get frustrated when I can't find enough time to bead and am anxiously waiting to be able to quit my part-time assembly job. I attend local craft shows and art fairs as well as several county fairs in my area. I also have an Etsy site, CharmedGifts.etsy.com. I own a small gift shop in an even smaller town where I display my jewelry and other handcrafted goodies. So far I have entered three Fire Mountain Gems contests and will continue to enter every year... it's so much fun! I'm hoping to learn more about charity fundraisers when I join the Upper Midwest Bead Society. What could be more rewarding than beading to help people in need? Show up at your beads and let them speak to you. Show up every day! Don't be afraid of making 'mistakes'. Be proud of what you do! View all of Rebecca's designs in the Gallery of Designs.